So I was planning on waiting until the winter to pick up a TT/Triathlon bike. But this one came up on the mailing list of the Tri Club I belong to here in Colorado. Went to go see it and ride it on Sunday night. Fit great and I'm a big Specialized fan. Has a nice Zipp cockpit upgrade and Fizik saddle (which is my favorite saddle brand - also on my road bike). The wheels are just training wheels (Asyrium) and nothing special. But with what I saved buying a used vs new bike, I can afford to pick up a nice set of race wheels over the winter. 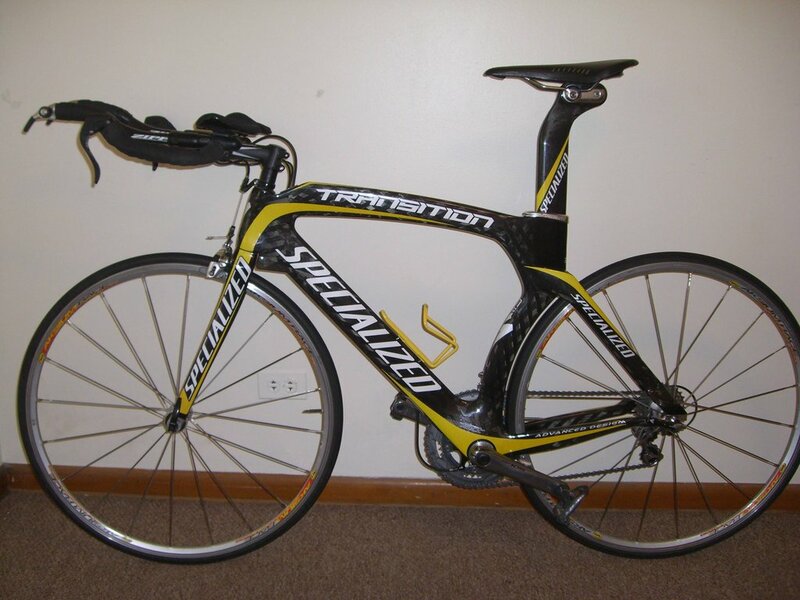 It's squirrely as you expect a TT bike to be. Feels like the Cann-O-Swill (crit) that I own - way out over the front wheel. But I can definitely get in a good aero position on it. Looking forward to throwing it on the trainer with the video camera and setting everything up just right. Then also getting a sweet wheel-set to really make it fly.